Trail C7E Charleston Ready For Snow! Trail C7E from the junction with C7F, north of Esperance,to the Town of Florida trails is ready to open when the snow arrives. 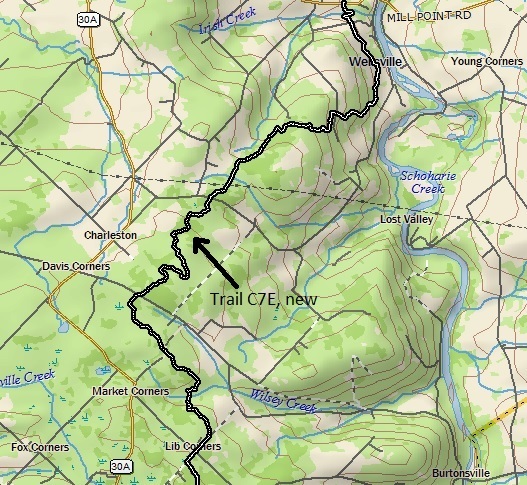 tight and rough trail sections. There is a lot of new trail, and this trail will be improved over the coming years. Trail signs are still being put up at this time. This is a Frontier style trail, go slow. Burtonsville - Monday - 2/5/18 - 12:00 AM - Trail Boss John Scrima reports ALL TRAILS ARE OPEN at this time ! Duanesburg & Delanson - Sunday - 3/21/17 - 12:00 AM - Trail Boss Aaron Nickloy reports ALL TRAILS are now CLOSED! Mariaville - Sunday - 2/4/18 12:00 AM - Trail Boss Jerry Schoening reports ALL TRAILS ARE OPEN at this time ! Esperance & Sloansville - Sunday - 2/5/18 - 12:00 AM - Trail Boss Laudy Hoyenga reports ALL TRAILS ARE OPEN!